My parents have been overseas for 4 weeks. They are travelling and cruising (in a ship!) around Italy, Spain, France, London – with a whole bunch (like 16 of them) of their childhood friends! I’m terribly jealous! Anyway, my parents have 7 chickens living in their backyard. My parents also have lovely neighbours who feed those chickens on alternate days. While I pop over to feed them every other day. I usually drag my 3 year old son along for an adventure of “Feeding The Chickens”. He is always excited about the chickens, but he also is utterly terrified of them. 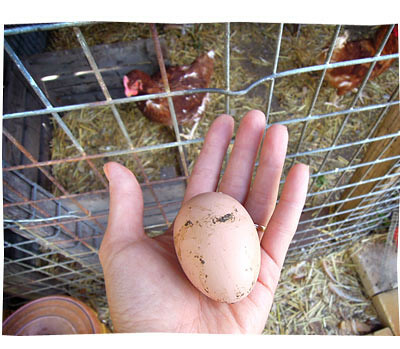 Well, yesterday I was trying to collect an egg from the chicken coop. It was in the furthest corner of the shelter, covered under a pile of hay. I crept into the shadowy, smelly, hay-strewn, poo-covered, wooden cave. I took two steps in. I was holding onto an inner frame of the hut with one hand. I carefully balanced on one foot, stooped down like a ballerina to scoop up the egg with my other hand. When Liam SLAMMED the door shut behind me! The latch flew up and caught into its lock. OMG I WAS TRAPPED INSIDE THE CHICKEN COOP!! I was standing on one foot, holding onto a wall with one hand and an egg in the other one hand. It was ridiculous! I was like – LIAM WHY’D YOU SHUT THE DOOR? “NO! The chickens will come out if I open the door!! Our pointless shouting went back and forth like that for a good 5 minutes. And he refused to unlock the door because he was mad at me. Oh boy was I mad! While standing on one foot! OK I probably could have placed the egg carefully on the ground, dodged all the crazy chickens. Regained my balance, back up into the doorway and unlatched the door myself. But I was so angry… (and I didn’t want to step on chicken poo) I wanted HIM to admit that he was wrong, for HIM to open the door and for ME to win on principle. In the end, I realised that I was the one stuck in the cage. Welcome to my world of daily battles with a 3 year old. « Reminder: $1000 my-wardrobe Giveaway Ends Thursday night!